- a plated dinner; a dirty plate. - candy bar in the wrapper; a half eaten candy bar. - a dog sleeping; a dog awake. - a person reading a book from behind (so you can kind of see the title of the chapter on the page); a person reading the same book from the front (so you can see the title of the book). If you guys have any ideas or anything you’d like to see us attempt, please feel free to let me know! Clean and dirty laundry? Hah thats what came to my mind! What a great idea. Let me think on this. Cool idea. I’m laughing at goofy girl’s comment–it sounds like something I would think of. I love the way you make connections and interactions with people. That’s a real talent! Hey, there’s an award at my place for you. How about an egg in its shell and one broken open, or a raw and cooked egg? A sky shot in daylight and at night or a cloudy and clear sky? Liquid water and solid water (ice)? A dandelion bloom and one gone to seed? Hmmm… I’m sure I could come up with more ideas. I’ll have to think about it. Goodness, it looks as if you’ve been in the creative mood. Neat ideas! I love this idea it is perfect for the photographer in you! 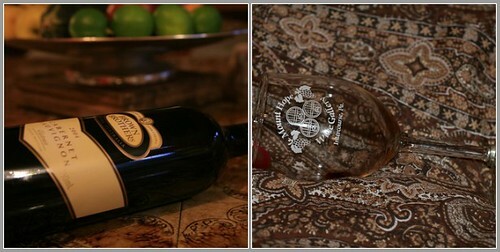 I also really like the tapestry behind the wine glass very rich looking….. Very cool idea. Wish I wasn’t so brain dead or I’d think of something. But I love these photos! I don’t think I’m game ready. But we’ll see…. I came from Michele’s place. Thank you for stopping by.. Love those pictures too!! Would it surprise you if I said.. Flowers and vases? She’d shoot falling leaves if she were capable. She appears to be having difficulties. Patch of dirt, blooming flowers.